Right now: Emma teaches at Bikram Yoga City in Stockholm. She blogs for Damernas Värld, and writes about everything from fashion to exercise and travel. Tell us a bit about yourself and how you came to be the person you are today. Yoga has played a big role in having made me who I am today. Before I started working full time teaching Bikram yoga I worked in various major fashion companies, and at a PR agency that mainly works with fashion. Unfortunately, I ran into a few sharp elbows during my fashion career. I did not really feel at home. And after some extremely stressful periods when I had to work late into the evening, I realized how bad I felt. I was no longer taking care of myself. It wasn't until I didn’t have time to practice yoga that I truly understood how important it was to me. After a break from everything and a long stay in Australia and Bali, I decided to work with what I love most - yoga! Because fashion is still a great interest of mine, I have my lifestyle blog at Damernas Värld where I write about everything from outfits to exercise and other musings. The yoga grounds me while the blog awakens the creativity in me: it’s a wonderful combo that has made me who I am today. I really enjoy being in the yoga studio and at home in our apartment. I’m pretty good at feeling at home wherever I am, as long as I have loved ones around me. What have you missed the most being pregnant? Cured meats and stinky cheese! Towards the end of my pregnancy, I have also felt that I lack a good deal of energy. Have you benefited from Bikram yoga during your pregnancy? YES! When I’m not teaching, I am in the studio practicing Bikram yoga. It is so incredibly important for me to be active, to feel strong, to get sweaty and to focus on breathing. At times when I felt tired or awkward, or when the pregnancy hormones washed over me, I can honestly say that a Bikram session could blow all those “pregnancy problems” away. The yoga is also good for my partner, because he gets a happier partner when I’m doing yoga. I even think the little one in my stomach appreciates it when I’m active and breathing deeply. I usually get a few good kicks during a session. What are your best tips for other pregnant women? Do not take comments about your stomach or body personally. Many people will want to weigh in and say what they think about the size of your stomach – just shake it off, I say!! 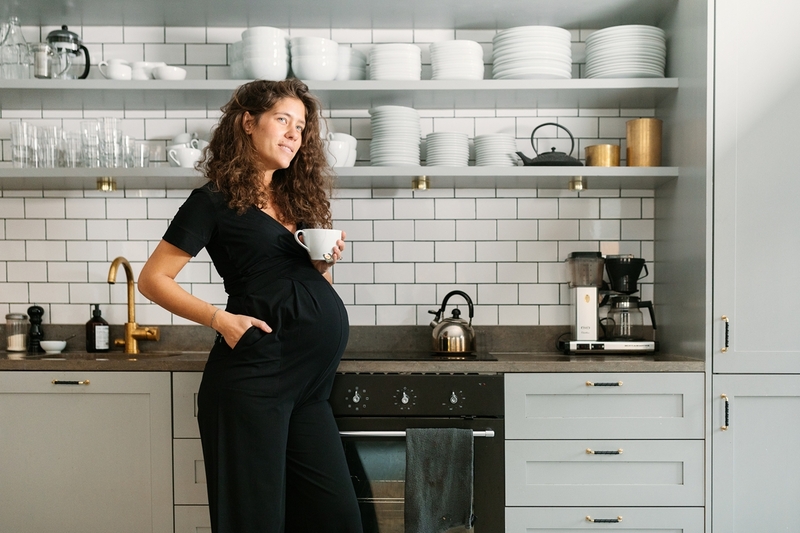 Invest in comfortable maternity clothes; you will be pregnant for a good while and having clothes that fit comfortably over your stomach is like a luxury. Focus on yourself, treat yourself to pregnancy massages and good food, and do not forget to be active! What are your thoughts on style and clothing as a pregnant woman? I think I have been able to maintain my personal style pretty well during pregnancy. 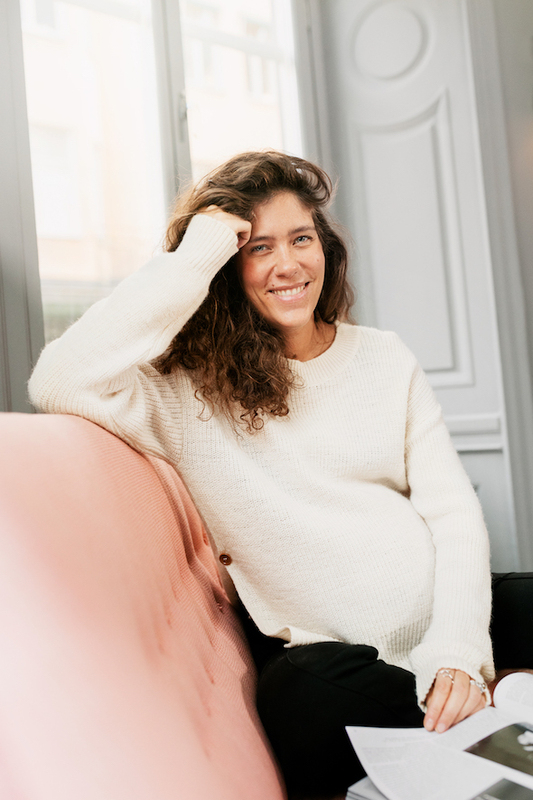 I like basics and oversized garments, so I have been able to use a good deal of my “regular” wardrobe during my pregnancy. Even when I purchased maternity clothes, I considered whether or not I could also wear the garment after pregnancy. Sustainability for me has a lot to do with good quality: quality garments that are produced in a safe and environmentally friendly way, and that last a long time. When it comes to baby clothes, I have not bought so many new things, but mostly borrowed clothes from close friends whose babies have outgrown them - a smart way to reuse garments that are not used for very long. My curls! And of course my calm and positive attitude that everything will solve itself - good things happen to good people. I hope the world looks up from their mobile phones more, that we see each other and help each other. A world that is more here and now, and not so connected and controlled by technology. Right now? An uncomplicated delivery and getting to bring our little bundle home to our apartment. Quite simply, to start family life.